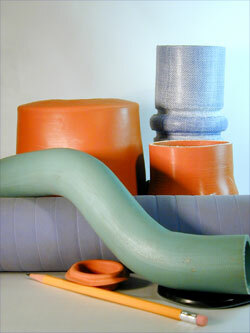 Warwick weaves and coats specialty fabrics for reinforced rubber. We custom formulate reinforced rubber systems that take into consideration the most effective fiber, weaving construction, and finishing opportunities. Warwick's advanced textiles can give your reinforced rubber diaphragms outstanding performance when subjected to heat, solvents, oil, water, abrasive slurries, and harsh chemicals. Warwick is set up to solve challenges in adhesion for reinforced rubber. We use proprietary materials based on Resorcinol Formaldehyde Latex (RFL), silanes, and isocyanates. In addition, we use selected bonding agents that increase the durability of your products. We work with you to tailor a solution to improve your product's textile and adhesion construction. Our facility offers vertical handling, from design of the reinforcement fabric to final finishing. Products made at Warwick do not leave the plant at any time from weaving through adhesion, eliminating handling and contamination by mutliple manufacturers. Our quality system ensures exceptional consistency and provides an unmatched level of customer service. DuPont™, Kevlar® and Nomex® are trademarks or registered trademarks of E.I. du Pont de Nemours and Company.